A tragedy in 3 parts. Khaled Al Najar is a simple, but proud and dignified Palestinian farmer from the small village of Qawawis in the South Hebron Hills. But today I saw him wipe a tear off his cheek. 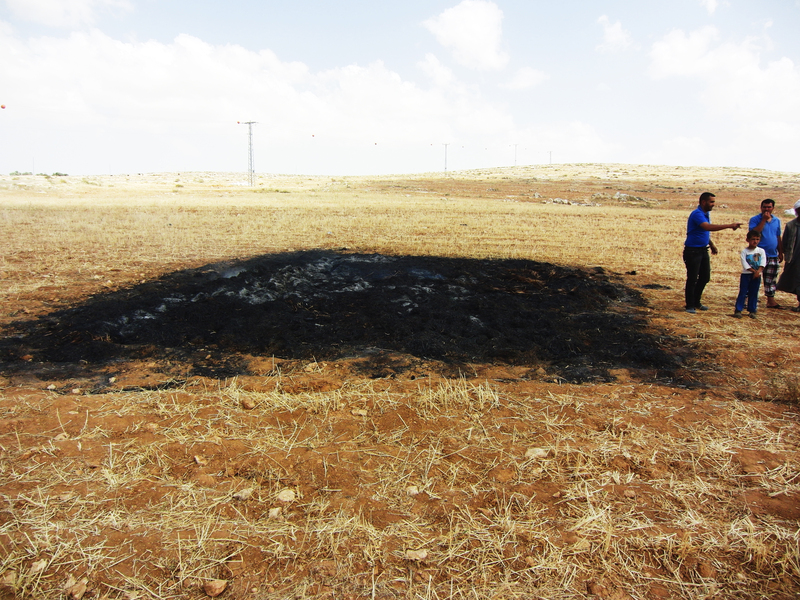 On May 22, two Israeli settlers torched Khaled’s entire harvest. Months of labor, 3 tons of wheat, several tons of animal fodder and the 3-4 monthly wages his family of fourteen was to live on for the summer disappeared in an inferno fueled by hate and the misinterpretation of God’s promise. Two Israeli settlers set fire to Khaled’s wheat harvest, destroying not only months of labor, but also the income that Khaled and his family of 14 intended to live on during the Summer. Photo c/o Operation Dove. I was woken by a call at 5 am. Our good friend and driver, Abed, had received a call from his brother who is a Palestinian contact in the Israeli human rights watchdog organization B’tselem. “Khaled’s harvest is burning. Should we go?” Abed sleepily said. He is all too used to the occupation; he has never seen anything else. I immediately called our Italian colleagues in Operation Dove who live nearby. They were already at the scene, and there was nothing for us to do but to come back in the morning to write yet another report. Everything was lost. But nothing prepared me for the story I would hear. 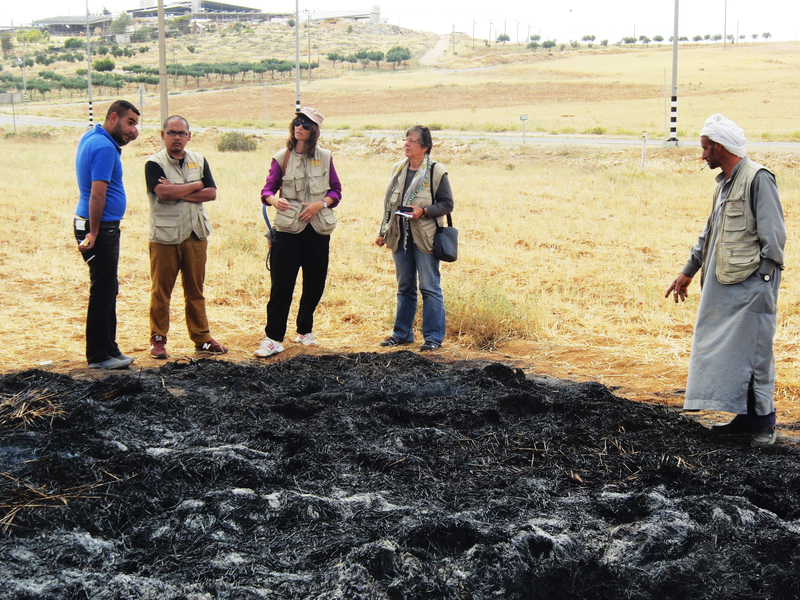 EAs inspect the damage to Khaled’s wheat harvest. Photo EAPPI/H. Tyssen. When my three colleagues from EAPPI and I arrived at 3:00 pm, a group of Israeli settlers on tour were making their way back into their bus. Apparently the misfortune of Palestinians is the newest attraction on their sightseeing tours in the West Bank. 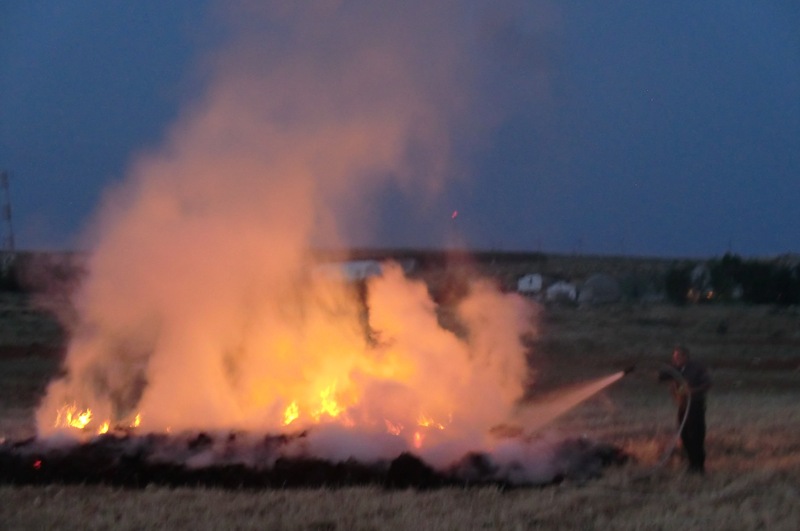 Khaled stood in the middle of his field, watching what once was his livelihood reduced to a pile of ash, with tiny flames still sparking up wherever they found some remnants to devour. The day before we had seen him finish the harvest of his 25,000 square meters of wheat, and everything was done painstakingly by hand. He had left it on the field to dry. At about 3:45 in the morning, a worker from his village had seen a car with two settlers circling the area. But the car was already late for the checkpoint crossing into Israel, where you have to be at 4:00 am to be in time for work, and the driver was unwilling to stop. 10 minutes later another worker saw the two settlers torch the pile and make for a quick escape. That’s when Khaled was called. “I couldn’t do anything”, he says. “When the army arrived they didn’t help, but told me to shut up and stop being so agitated”. The police came and asked the army to move away but did little else. Khaled’s field is in Area C, where only Israeli forces have authority. They are less than inclined to use it in favor of the Palestinians. He watched it all burn, while a single fireman took his time to extinguish the, by now, diminishing flames. He reported the crime, but without video evidence we all know nothing will happen. Khaled runs his fingers through the ashes and despairingly tells me something in Arabic. And this is when I see it. A solitary tear runs down his face. I go through our standard questions, and have never felt so bad doing it. “Can I interview you? Can I take pictures? Can I use your full name?” He looks me in the eyes. “Use what you want. What more can they take from me now? I only hope Allah has mercy”. Despite the gravity of the situation, I find it surprising. The Palestinians I know are not the ones to give up. Khaled lifts his shirt, and we gasp. His stomach is hanging over his belt in a grotesque manner. “It hurts for him to work”, Abbed says, “He was shot by a settler in 2001”. I humbly ask him to tell the story. The memories, on top of his lost harvest, are too much. He becomes quiet, sits down and lights his cigarette from some still glowing coal. While we stand there in silence, a small bus pulls up. Out climbs a large set Jewish man, but this is not a settler. We immediately recognize Yehuda Saul from Breaking The Silence, who has devoted the last 10 years to tell Israel and the world of the atrocities he and other soldiers have committed while serving in the occupied Palestinian territory. He has a group of internationals from different organizations with him, and starts to tell yet another story. “In 2004 this man (Abed) came to farm his land, but found settlers planting vine ranks here. He told them it was his land, and they replied it had been given to them by God. With the laws the Israeli Civil Administration applies for Palestinians in these cases, proving what is your land is like proving that you don’t have a sister. But Rabbis for Human Rights took the settlers to court. You know how long it lasted? Seven years. And for all those years, the settlers grew their grapes here. But Khaled actually won. And in 2011, for the first time in all of the West Bank, the settler’s grapevines were uprooted for a Palestinian to take back his land. That’s when the settlers slashed the tires of your car, right, Abbed? While the army was watching?” Abbed nods. “He lost 7 harvests. Then he had two good ones. And then this happens”. The other internationals are as baffled as we are, but Yehuda, Abbed and Khaled has seen it too many times. They just shrug. How long does it take to live under these conditions to just shrug off such injustice? What remains of Khaled’s wheat harvest. Photo EAPPI/H. Tyssen. Khaled was shot by a settler. Settlers took his land for 7 years. Now they have torched his livelihood to the ground, and there is absolutely nothing we can do. We express our sympathies, and they feel so hollow. We shake his hand and he smiles back at us while we all walk away; him back to his family of fourteen, us to write our report. As we get in the car I feel more than a solitary tear pressing. There is no way I, who am going back home in three months, am going to cry while Khaled walks away so proudly, carrying all his tribulations on his shoulders. The blog The tribulations of Khaled al Najar first appeared on Lille Ville Vestbredden, a blog of EAPPI Norway. The daily reality of having to crossing an agricultural gate and rely on soldier behavior in order to access your farmland, and thus, your livelihood. 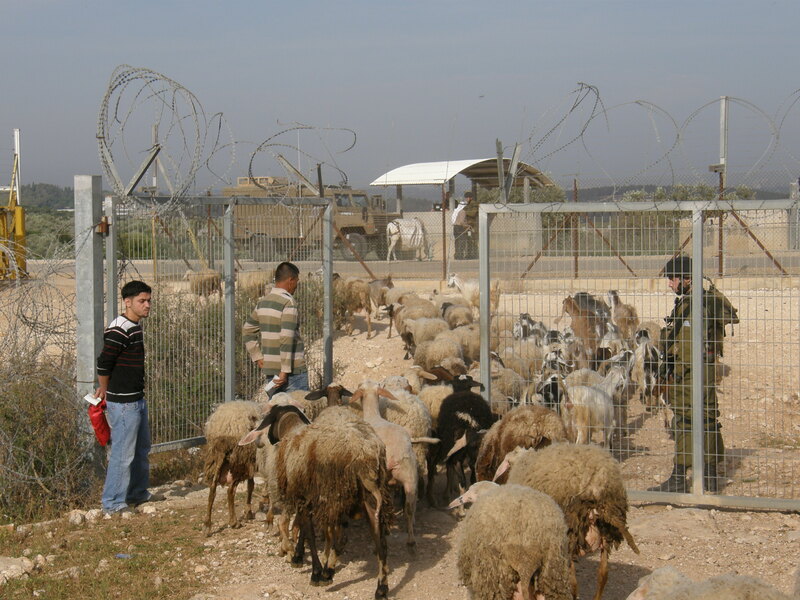 A shepherd and his sheep go through ‘Akkaba agricultural gate. Photo EAPPI/K. Osterblom. “The occupation is a cancer in the blood.” These were the words of a Palestinian farmer waiting to cross North gate, one of the 80 agricultural gates situated in the West Bank. To reach his land, on the other side of the separation barrier, he must get a permit from the Israeli authorities and ensure that he crosses the gate during the opening hours that are decided by the same Israeli authorities. Over recent years, the number of permits issued has dwindled and the opening hours have become shorter and more sporadic. And yet still, the farmers must comply with these regulations, decided an occupying government and implemented in occupied territory: the alternative would mean losing one’s livelihood. 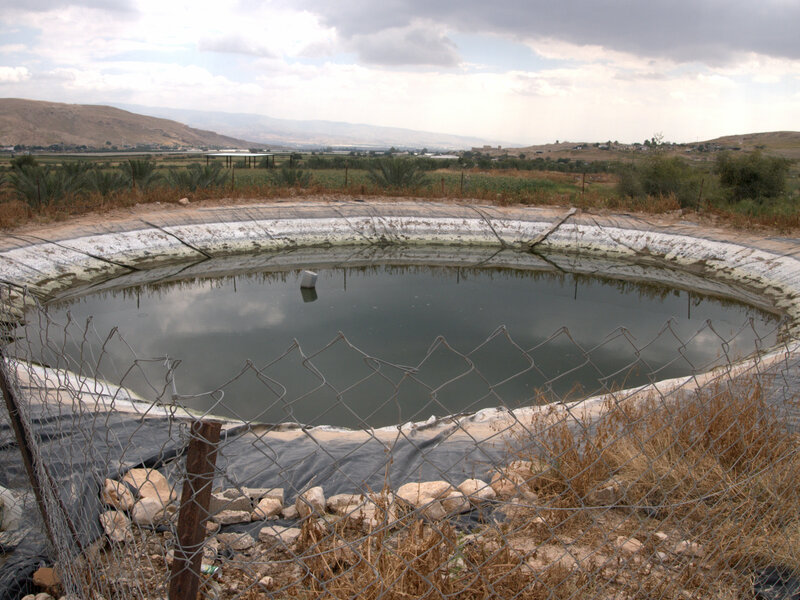 Being based in the Jayyus/Tulkarm area, a large part of our work involves monitoring these agricultural gates. The intimate setting – a sort of magnified version of a checkpoint – means that we are able to observe the soldiers and Palestinians very closely, watching the scene play out. Perhaps the most unnerving thing that we observe is the unpredictability of the soldiers’ behavior. Imagine having a boss who banned you from entering your office one day for wearing trainers, only to open the door for you the following day despite the fact that you were still wearing the same trainers. From where we stand, a lot of the measures carried out as a result of the occupation seem to be dependent on the mood of the soldiers. “This is my country,” were the words uttered by one soldier manning an agricultural gate, as he stood in front of around 80 farmers waiting at ‘Attil gate to cross over the separation barrier (85% of which, when completed, will run inside the Green Line). Earlier that morning the same soldier had, at a nearby agricultural gate, made each Palestinian lift up his trouser legs and t-shirt, sometimes instructing them to remove one or two shoes. There was no rhyme or reason to his behaviour; not every farmer was treated the same. He even told one to put out his cigarette whilst he was talking to him. Occasionally the soldiers show an interest in what we EAs are doing at the gate. To hear this coming from a man fully armed whilst standing in front of a group of unarmed farmers waiting to get to their land was quite surprising. This statement demonstrated the degree to which the ‘them and us’ mentality is so deeply ingrained, which will poison to any proposed peace solution, whether two or one state. 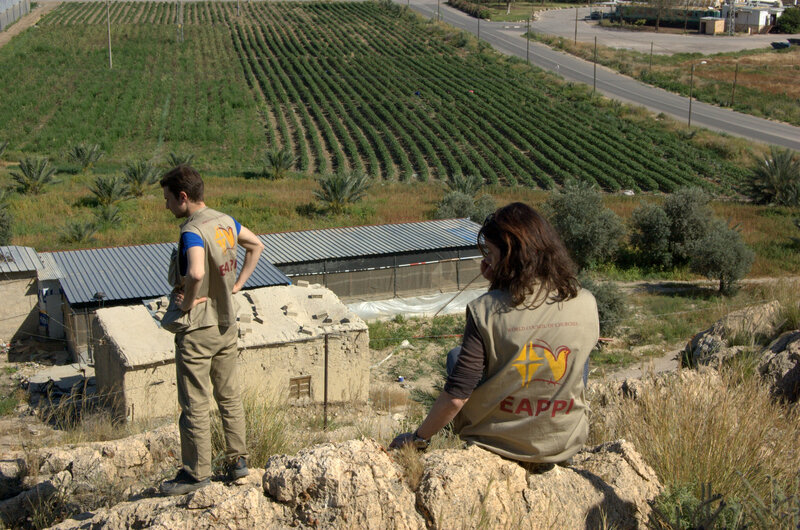 A soldier at Far’un agricultural gate in the Jayyus/Tulkarm area. Photo EAPPI/D. Montagut. Workers and farmers wait at Far’un gate in order to enter and cultivate their land. Photo EAPPI/D. Montagut. Some things we see would be funny if they were not so tragic and symptomatic of the absurdity of the occupation. At one gate, ‘Akkaba, a flock of around 100 sheep were let through the gate before their shepherd, who was subsequently refused entry – he was not even allowed to go through the gate to retrieve them, and had to ask his brother to tend them. Another man, Ahmad Said, who lost 250 of his olive trees due to the construction of the separation barrier across his land, is on the permit blacklist until 2099. What had earned him a place on this list? Not the fact that he had been to prison, but the fact that in 2003 he had been involved in activities against the wall. Not only is it important to be aware of the poor treatment of the farmers and workers that is meted out by some of the soldiers, but also to consider what agricultural gates mean in the more general sense. They represent yet one more obstacle preventing Palestinians from accessing their own land. Needless to say, these gates have serious economic consequences: because the gates are not open all year round the farmers are unable to tend to their crops continuously, which greatly affects their yield. During the month of March 2014, ‘Akkaba gate was opened late on numerous occasions, with delays ranging from 15 minutes to 1.5 hours. On 22 April 2014 the soldiers arrived 2 hours late. This unpredictability makes life incredibly difficult for the farmers, as by the time they reach their land it is already getting warm. 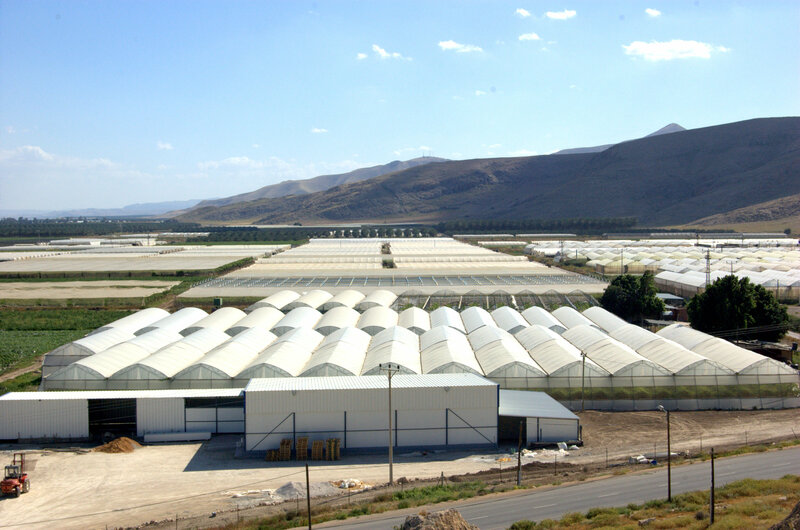 More worryingly, the unpredictable behavior of the Israeli soldiers demonstrates a lack of respect for the Palestinian farmers and workers, and a complete disregard for their livelihoods – if the farmers are not informed of the correct opening times, they cannot rely on being able to use their land for a stable income. The Israeli government, as the occupying power, has an obligation to provide for the basic needs of the population – this means that they should be facilitating, rather than preventing the occupied population from being able to use their own land in order to make a living. If a two state solution does come into existence, and the borders are drawn along the line of the wall, it is likely that these problems faced by farmers and workers will be greatly exacerbated, perhaps to the extent that they will no longer be able to gain access to their land at all. In the meantime, what is to be done? As one Palestinian woman said, ‘my existence is my resistance’. In that way, persistence is also a form of resistance – the farmers keep going to their land to demonstrate to the soldiers that they will not surrender. As for us EAs, we keep calling the Humanitarian Hotline, the phone number given for the Israeli authorities who are supposed to improve these issues, because we want to show that we will not give up. As one exacerbated woman on the end of the Hotline said after having been called at least 5 times that morning by us – ‘don’t worry, we won’t forget you. It’s not possible’. Good: we will keep calling until there is no longer a need. On March 25, 20 families, consisting of approximately 125 people, most of who are children, were forcefully evacuated from their homes due to Israeli military training in the area. The families moved only 200-300 meters away from their homes and were forced to stay outside without shelter until around 12:00AM. This was the second time this month that the families had to evacuate their homes for military training, and they have been ordered to evacuate on 02-03.04.14 as well. During the military exercises, soldiers drove tanks over fields of crops, causing extensive agricultural damage. Israeli military tanks roll through village of Ibziq in the Northern Jordan valley. The military operations taking place on March 25 caused 20 families to be evacuated from their homes. Photo EAPPI/T. Kopra. A Mukhtar in Ibziq sits in his home with his children after they had been evacuated for a day due to Israeli militarty training. Photo EAPPI/T. Kopra. Wheat fields in Ibziq after Israeli military training caused extensive agricultural damage. Photo EAPPI/T. Kopra.